Print and Make with Alison Hulme will once again be at Eau Brink Studio. 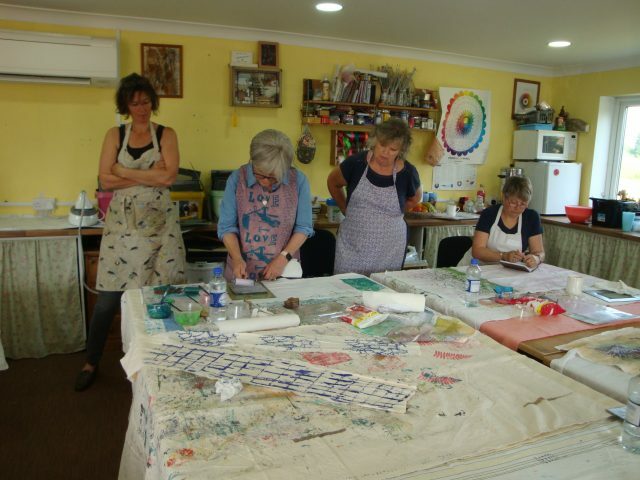 This exciting two day workshop will ensure that you take home with you a huge amount of printed fabric. Also you can finish a cushion, a apron or a bag on the second day. Alison is famous for her pinnies and can be found at most of the big fairs such as Knitting and Stitching shows. If you think you cannot print onto fabric using Acrylic paint think again. You can turn up without any experience and go home with your head buzzing with ideas. Alison will help you co-ordinate your colours and designs. You get to use her large collection of Thermofax screens to create your fabrics. It is a great two days of fun and laughter. Of course I will be baking so there will be scrummy cake as well as fruit and lots of hot drinks. Alison Hulme 2 Day Workshop 2oth and 21st June 2018. 10 till 4 daily. Day 1 – Learn how to print onto fabric using screen printing, Thermafax screens, Printing Blocks and a variety of stamping implements under the expert tuition of Alison. Day 2 – Make either a bag or one of Alison’s fabulous pinnies with step by step instruction from Alison. £120.00 + materials. Suitable for all levels. Sewing Machine required on day 2 but some are available if booked in advance. Call Anita 01553 762115 for more details.